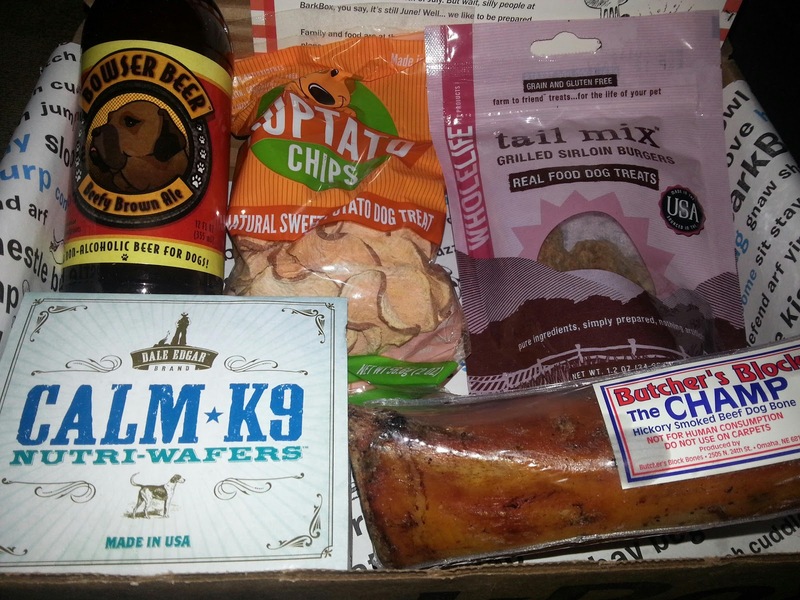 The third Bark Box arrived mid-June, at the onset of my techno-silence. Jedi had his nose in the box right away. It was all I could do to snap a quick picture! Want to know what was inside? Jedi was most interested in the Smoked Beef Bone from Butcher's Block Bones. When I wasn't looking, he stole it from the box and took it into his crate, plastic wrapper and all. That dog loves bones more than any dog I have ever met! The thing that caught my eye right away was the bottle of Bowser Beer. It's not really beer, but a beef-based drink fortified with glucosamine. I thought it was odd but the dogs liked it. Also included was a bag of Puptato Chips from Puppy Cake -- the same company that makes the cake mixes that I reviewed a few months ago. These chips are baked, thinly-sliced sweet potatoes. Roxy turned her nose up at them. Jedi ate them (honestly, he eats everything) but he seemed not to like them as much as the dried sweet potato sticks we found at Pet Supermarket. The last thing in the box was really surprising: Calm K9 Nutri-Wafers. This is from Dale Edgar Brand. Honestly, I'm skeptical. But Jedi gets so anxious riding in the car -- STILL! -- that I'm willing to give it a shot. How am I ever going to show him if I can't get him to ride in the car? 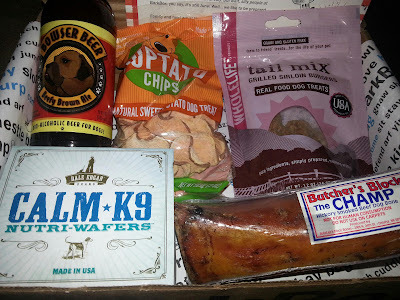 I had intended for this to be our last Bark Box. Although fun, they are a bit pricey, and this time of year most of my disposable income goes to the electric company to pay for air conditioning. Unfortunately, I didn't cancel our subscription fast enough so we're getting three more. BTW, Jedi doesn't mind. The fourth Bark Box arrived while I was at the dog show in West Palm Beach, so this post is a twofer! 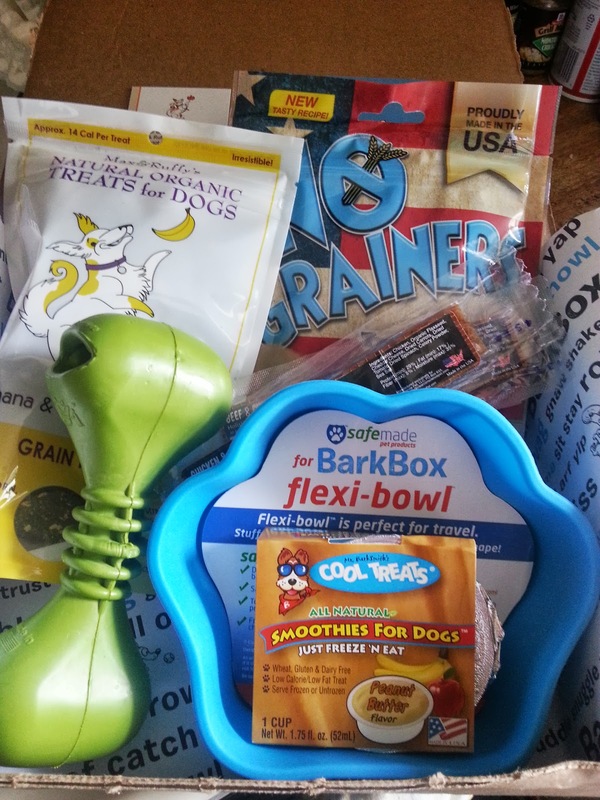 Another just-for-Bark-Box product was a small Flexi-Bowl from Safe Made. This thing is really cool. From the website: "Stuff it, pack it, roll it…no matter what you do, the flexi-bowl™ bounces right back into its cute paw shape. Perfect for the pet traveler, or as a fun dish at home, flexi-bowl™ is dishwasher-safe for easy cleaning and disinfecting. It’s even OVEN safe to 450 degrees—so go ahead and bake treats inside—for your pet—or yourself!" and then there's a link to recipe ideas! This thing has me written all over it. Wish I had some more Puppy Cake mix . . . There was a bag of Banana and Coconut natural organic treats from Max and Ruffy's. I thought they smelled really good, but Jedi wasn't impressed. I gave him one and he mouthed it, dropped it, and picked it up again several times. He ate it -- eventually -- but we have learned from the phone incident and the tampon incident that Jedi will eat pretty much anything. Also included was a Peanut Butter Smoothie from Mr. Barksmith's. Jedi loves frozen treats, so I was anxious to try this one. It took hours to freeze and was gone in less than 5 minutes. Last, but not least, there was a bag of No Grainers training treats. Perfect timing! Now that we are gearing up for our first real dog show, I'm going through training treats like crazy.